Athletic Cut Tank With Seamless Contruction And Ventilation Panel Design For Breathability And Temperature Regulation. Peak physical performance demands equal technology. The lightweight, seamless construction of the circuit performance tank’s fabric pulls excess sweat, while strategically placed mesh panels provide heat ventilation, delivering comfortability to help you perform longer. Contrast ventilation panels provide a look that highlights your athletic figure, making you stand out in the crowd. Seamless construction: This women's athletic tank minimizes chafing and adds to the modern aesthetic. Ventilation panels: Flattering athletic side panel’s design adds breathability and improves temperature regulation. 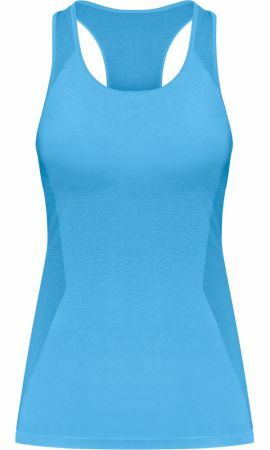 Athletic Cut: This blue racerback tank features a v-shaped athletic cut that complements the results of your training. No Circuit Performance Racer Tank Reviews Found.